The affordable Klipsch R-2800-C makes discrete audio a convincing reality for almost anyone. 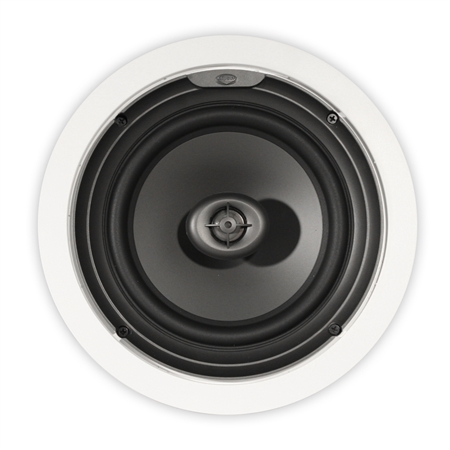 Upholding the same high-performance standards as all Klipsch products this in-ceiling loudspeaker employs an 8-inch gray polymer woofer cone and a 1-inch soft/silk dome tweeter to deliver superior and seamless sound. Available in a white finish this speaker can be paired with the Klipsch IK-800-C installation kit (sold separately). This revolutionary kit design incorporates a mud ring breakaway wire tie and color-coded brackets for easy speaker size identification. It also includes perforated metal wings that easily fasten to the studs via screws staples or nails. Painted white for easy marking and placement these metal wings can be folded around the edge of the studs if necessary.